Good point. The air bag is about 2lbs. The passenger's is about 5lbs. The tear down continues . . . 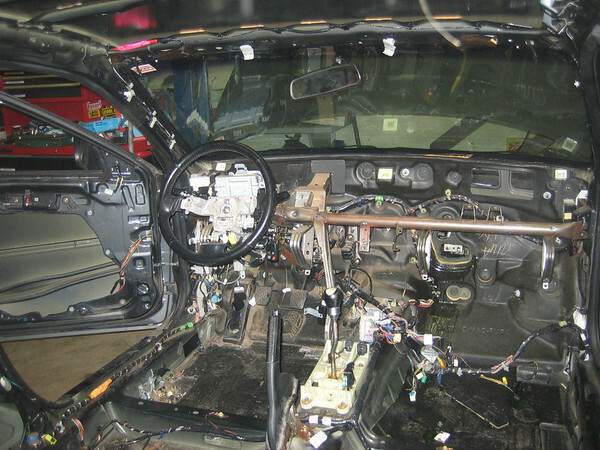 Here we finally have the dash out. A person could suffer a death of a thousand cuts getting that thing out of there. 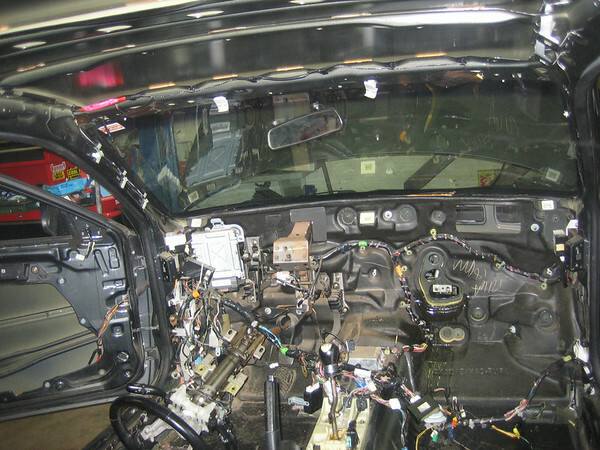 Here's another shot after the heater/AC box has been removed. 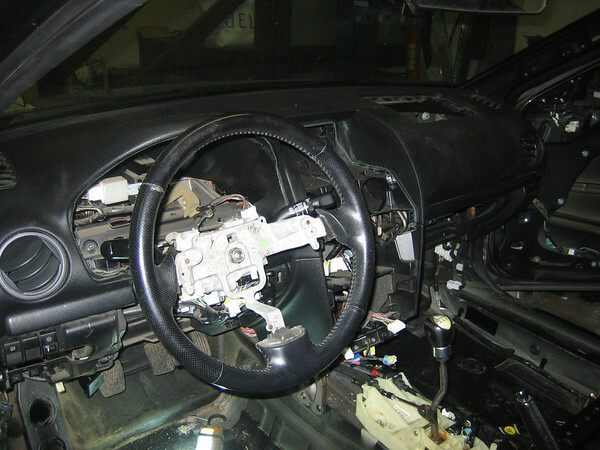 And here we are with the structural part from the dash assembly re-installed to support the steering column. Almost done stripping the cabin! racing seat going in of course? That's what I'm working on. I got the feet cut off the Mazda's seats and adapting them to my race seats. 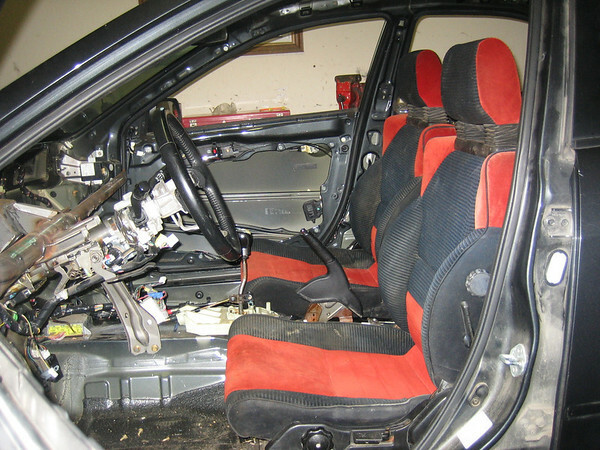 This will be the third car I've had these seats in - they're starting to look a bit ratty, but I'm cheap. I'll post a pic tomorrow when I get them set in place. This is a win. CF hood/trunk going on as well along with a lightweight battery? And, you should be able to drop ~20 lbs just by switching to coilovers. They were a night and day weight difference between my MS Hatch springs & bilsteins. Also, with the decreased weight in the front corners, the steering is much quicker/lighter. and finally the map box for my idiot friend who broke his. GL with the build. will be curious to see how this compares weight wise with what logan ripped out of his. Did I mention I was cheap? I'll be removing all the structure from the body panels leaving just the skins, but no carbon fiber. you should be able to drop ~20 lbs just by switching to coilovers. They were a night and day weight difference between my MS Hatch springs & bilsteins. Also, with the decreased weight in the front corners, the steering is much quicker/lighter. I've run coilovers on other cars and hope to on this car as well. I'll need to sell more parts. Send me a PM with your Zip code and I'll send you a price with shipping. Sorry, Mine is no better a few lines don't work at times. finally the map box for my idiot friend who broke his. Sorry, Map box and lid is sold. First mock up of the seats. Still some work to do. Brackets made and seats bolted in. 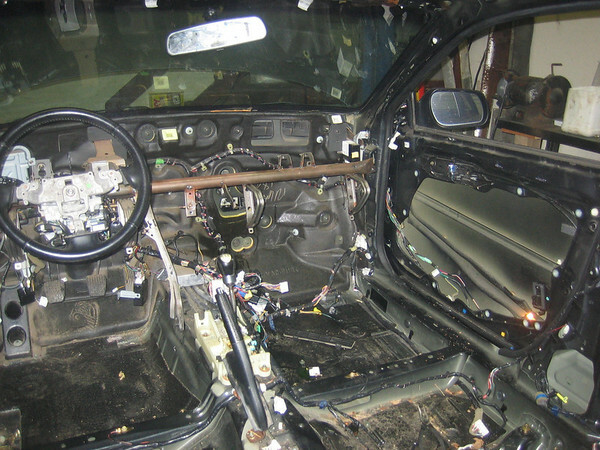 Working on cleaning up the wiring harness - that will complete the stripping of the interior. 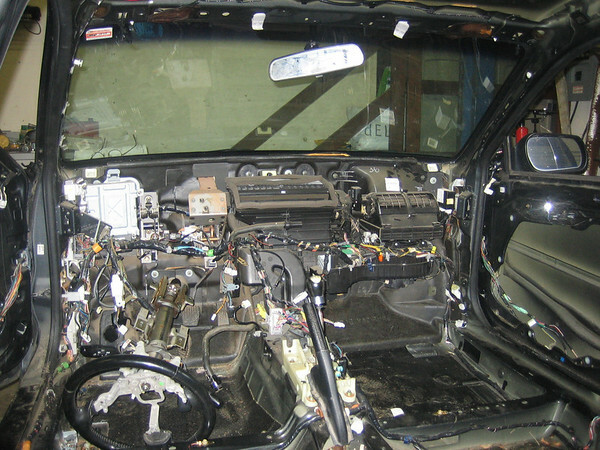 Next, remove the AC compressor and front & Rear bumpers. Need to get the harnesses in and pass tech before the Sept 9th event at VIR.